Hello there!! 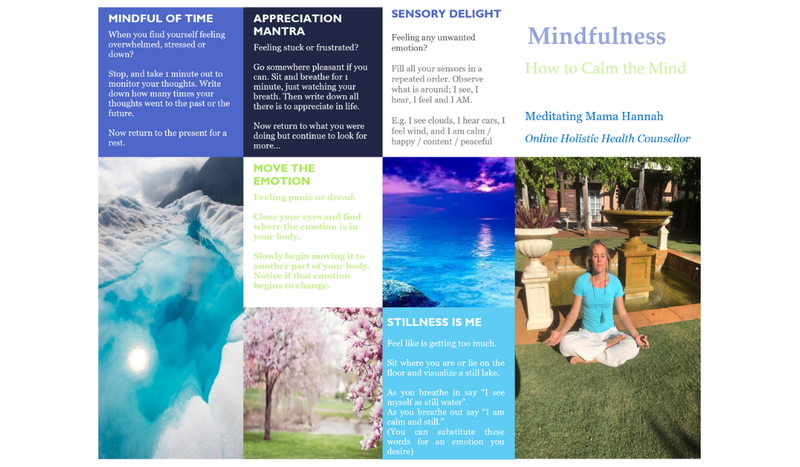 Today I want to look at mindfulness and how to calm the mind. If you read my post yesterday, you would know that this week has been a bit of an adjustment for me and my children. Both my girls started school (with different start and end times and only half days!) while my work has ramped up with some sizeable deadlines. I would have thought we would be the Queens of adjustments with all we’ve been through, but apparently not 😊. So today I made it my priority to stop, reflect and thinkitate (a fantastic expression I heard recently, via the # (www.mindvalleyacademy.com). It’s when you clear your mind to the point where you receive thoughts then you follow those thoughts). Like a mindfulness thinking session through a calm mind. It wasn’t the biggest of epiphanies really but just the fact that I stopped, took stock, and was able to reflect, meant I was taking all the pressure off just me, and tapping into my greatest resource… My inner being (or Source, or God, or Infinite intelligence, or Higher self), whatever floats your boat. You see, usually I get up before my girls and meditate every day, or I catch moments in my day to practice mindfulness to calm the mind. But this week I had been working late nights to accommodate for the extra daily tasks, and that meant I only woke up WITH my girls! So it was starting a busy day with an immediately busy mind. I realise that we won’t always be able to stop for meditation, because sh*t happens. But we can bring stillness and presence into our daily tasks, and better yet, find ways to be mindful throughout our day so that we don’t experience emotional overwhelm (like I did this week!). I’ve dusted off some of my favourite techniques which I thought I’d share with you. Let me know if you try any and if you love them. I’ve decided that I need to add this topic to my YouTube (Meditating Mama Holistic Health Counsellor) video series, so subscribe if you want in on that. When you find yourself feeling overwhelmed, stressed or down? Stop, and take 1 minute out to monitor your thoughts. Simply sit and observe what your mind wants to think about. Write down how many times your thoughts went to the past or the future. Now return to the present for a rest. Feeling panic, anxiety or dread? Close your eyes and find where the emotion is in your body. Slowly begin moving it to another part of your body. Play around by moving it all around the body. Notice what happens each time you do. Notice if that emotion begins to change. Feel life is getting too much? Sit where you are or lie on the floor and visualise still water (like a lake). As you breathe in say “I see myself as still water” or “as a still lake”. Fill all your sensors by observing what is around you. When all your senses are filled, your mind believes the next I AM statement. You must always say the I AM in the present tense as though it is done, otherwise if you say I AM going to be happy, you will remain in the sate of “going to be”…happy, rather than Happy NOW. Go somewhere pleasant if you can. Sit and breathe for 1 minute, just watching your breath. Write down all there is to appreciate in life. If you are going through a particularly difficult time, look for the most basic and small things to appreciate like taste or sight or your bed. “Not meditating is like trying to vacuum your house but refusing to plug it in to the electricity”.